Welcome to all my feathered friends. Today we are flitting around blogland to see all the ways that people have incorporated birds and nests in their home. I can't wait to see what everyone has done. I love this little glass terrarium. It has never been home to a live plant. It's the perfect way to display pretties. Why is it that something can look so much prettier in a glass container? This little birdy landed on a new book. Next week I'll share some of the pretty pages. I bought this little bird feeder back in the spring. It has been in the house all summer because I like it so much. Can you see the sweet little rock? It says, "Be blessed". I hope you all have a great time flying around to see all the birds today. 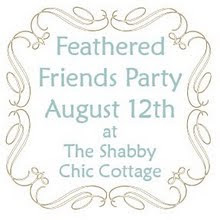 Be sure to visit The Shabby Chic Cottage for a full list of participants. I love terrariums too & have several in my own post. Great minds & all! ;o) I adore your little rock bird feeder...it is sooo sweeet! Stacey, I LOVE your little rock bird feeder especialy, but I LOVE your idea of the bird plate inside the glass terranium, just gorgeous!! Hi Stacey, oh, love your birds especially the one on the book corner....how charming is that?! Also the birdfeeder is adorable. A sweet collection of birds. They all look very happy where you've placed them. Very sweet. Like them all, especially the pretty terrarium. I know what you mean about finding a spot for something and leaving it there - I do the same. Love all of your little birdies! Thanks for sharing. A very pretty bird plate in the terrarium and the decorating book under the second little bird looks good:>) My favorite is the long trough with all the little birds on it. So sweet! Your birdies look so sweet all over your home. LOVE them!! Oh Stacey all your little feathered friends are so darn adorable... Loved them!!! Hello Stacey - oh how I love that sweet little birdie feeder nestled in the beautiful greenery. You are right, things look so pretty under or inside glass! That plate and nest are precious. Thank you for sharing! Love the little bird feeder, and the terrarium would be such a versatile piece. Looking forward to seeing what is inside those books!!!! ps. 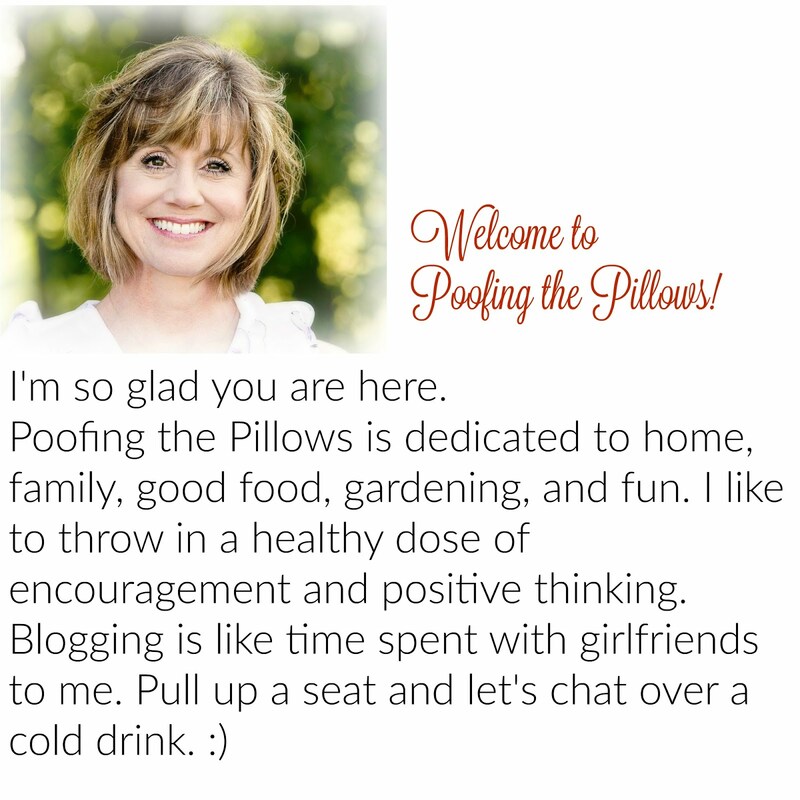 Love your header on your blog!!! You gave me a chuckle when you said that something can stay in one place for a year if it lands in a good spot. It's that way at my house too! I don't require constant change. I love the name of your blog. Very creative! Also, love all of your birdies. cute. cute. Hi Stacey! It was so fun to see so many of my friends at this party! I agree, putting something in, on or under glass gives it a special feeling. I hope that little bird is saving a copy of that book for me. The cover is beautiful. I'm going looking for it tomorrow. Hi Stacey, you have such a darling collection. I love the glass terrarium and the pussywillow nest is too adorable. I notice you too have the target S&P's! Don't we all? ha! Thanks for sharing your cute birdies! Hi Stacey! You're right, putting things under glass makes them pop! It looks beautiful. I love the rock bird feeder - it is wonderful! Thanks for sharing your wonderful things. I'm new to blogging, and am having so much fun visiting everyone! I love your arrangement in the glass terrarium - very creative. And the five little birds at the bird feeder is so sweet. Thanks for sharing! I'm bookmarking the blogs so I can come back and visit some more. So cute ... that birdie on the book is adorable! That little bird feeder is adorable. The new book is definitely one I would love to read. You are so accomodating...with your reds, your birds, your pillows, and your fashion. Whatever category the blog world gives...you can create a beautiful blog! It is always fun to visit you. You're right, Stacey. Everything does seem to really "shine" when under glass. Love your sweet birds and vignettes. And I can't wait to see more of this book I haven't heard of yet! Oooh...Girlfriend, I love that pretty glass terrariam! You right, everything always looks fabulous under glass...hehe! Love that sweet little nest and the pretty bird/music plate...so sweet! What a darling little bird planter...love the painted stone! Can't wait for you to share a few things out of your new book...I can tell that I would enjoy it just by looking at the cover! Well my friend...thank you so much for sharing a few of your feathered friends with us today! LOVE that feeder! It's so cute! I just love your little vignette in the terrarium. The plate is adorable. Your new book looks very enticing and I personally would love a peek at what's inside. I must fly away now to visit some more feathery friends. Your birds are very cute! Stacey this the sweetest post! Hi, Stacey girl...I love all your pretty little birdies. I like your little nest. Seems like everyone has a nest. Guess I'll have to get me one too. LOL ! Have a blessed day sweetie ! Stacey, that little bird feeder is absolutely beautiful! So chic! I haven't any bird things to share but if you go bother my big sis Tootsie I know she has all kinds of bird things ...live and not! Hope you have a great day! Smiles:0)! Your birds are just precious! I love birds too. I have quite a few of them and nests around my house. I have so much going on this evening I can't make pictures to post but wanted to tell you I think yours are awesome. Especially the feeder. I like all your little birdies! Great look in the terrarium!